Hope you all had a great holiday weekend. I can't believe it's already July. That means the year is already half way over, and we're getting closer to getting married (!). Here's what I whipped up for a Fourth of July potluck. This salad screams summer. 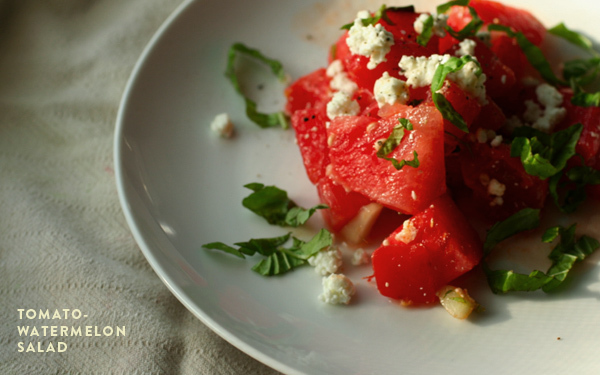 I love the combination of tomatoes and watermelon, especially with fresh herbs and salty feta. A great seasonal salad and a nice change from the regular ol' green salad. Like tomatoes, watermelon contains the amazing antioxidant, lycopene. Watermelon is also an excellent source of vitamin C. I love how refreshing watermelon is on hot and humid Carolina days (which is everyday lately). Mix the tomatoes, watermelon and cucumber into a large bowl. Drizzle with balsamic, lime juice and olive oil. Toss in the herbs, salt and pepper. Mix well. Garnish with feta. Feel free to omit the feta and add avocado to make this vegan. Enjoy! mmm this looks delicious! I love your blog btw! Looks nice. I love watermelon in a salad but have never had it with tomato or cheese. I usually stick with onion and a green! Sassy, let me know if you like the salad! 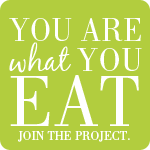 your blog looks sooo delish! Love your blogs! I am planning to try this maybe this weekend! I could never enjoy a salad without feta cheese or some type of cheese on it.